Mix the vinaigrette first, so that it has time to infuse the flavours. Slice the tuna or salmon into fairly thin slices, as you don’t want this to be too thick and remain raw inside. Toss this in some olive oil and dried oregano. Heat a non stick pan and add some butter and olive oil to this. When hot, place the tuna or salmon on one side for about a minute and then turn and do the other side. This should be slightly pink inside, but not too rare. Take out, place in a bowl and squeeze over loads of lemon as well as some Maldon salt and fresh black pepper. This can be broken up into flakes once cooked. Take your salad platter and place the ingredients separately, so the guests can choose what they want to put into their salad. 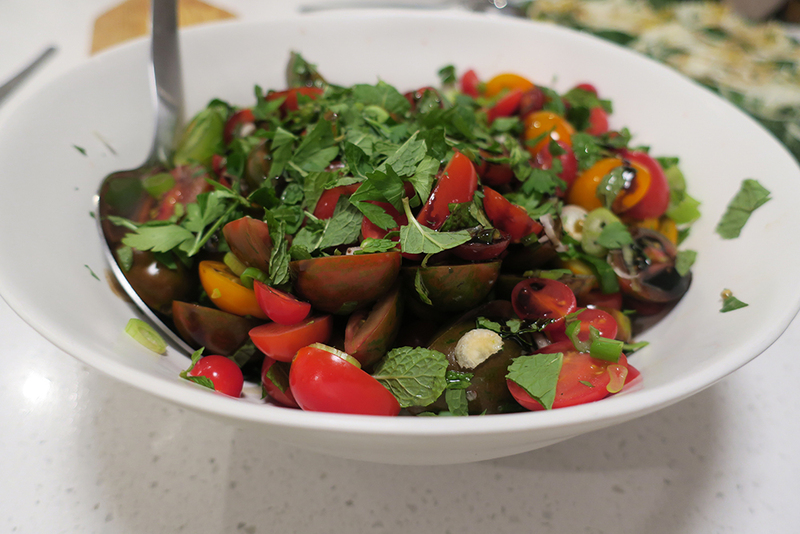 You could also add chopped Cos lettuce leaves to the bottom of the dish. Garnish with fresh oregano. Serve the dressing on the side for them to help themselves to.